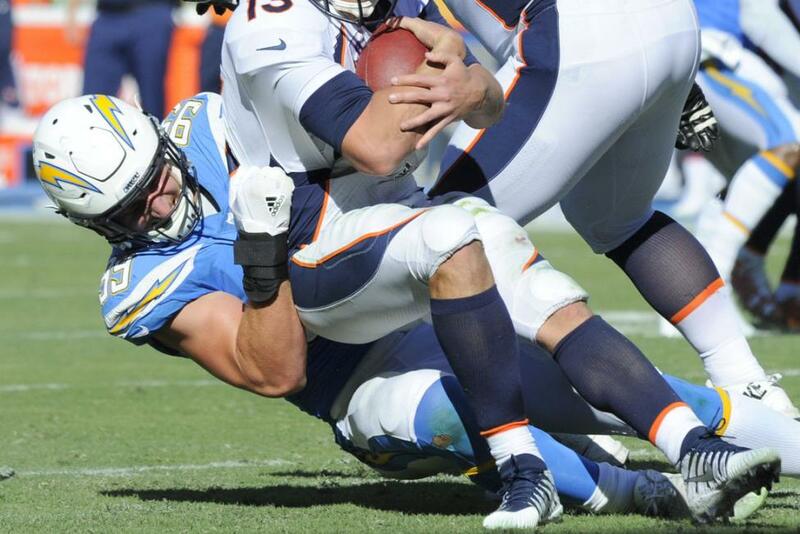 Los Angeles Chargers defensive end Joey Bosa left Tuesday's practice with a left foot injury, multiple media outlets reported. [post_ads]Bosa was able to walk off the field on his own, albeit without his left shoe, and was being evaluated, according to socalnewsgroup.com. A first-round pick out of Ohio State (No. 3 overall) in the 2016 NFL Draft, Bosa was named to the Pro Bowl in 2017 after racking up a team-leading 12.5 sacks while starting all 16 games. Bosa finished with 70 tackes and also had four forced fumbles last season. The 6-foot-5, 280-pound Bosa also enjoyed a stellar first season with 10.5 sacks in 12 games, earning NFL Defensive Rookie of the Year honors. Since entering the NFL, Bosa ranks fourth overall with 23 sacks despite missing the first four games of his rookie season with a hamstring injury.